When governor running each ball of the governor subjected an inward pull. Consider a governor running at a steady speed, then the inward force acting on the rotating governor ball is known as controlling force. Controlling force of governor is equal and opposite to the centrifugal reaction. In porter governor controlling force is provided by the weight of sleeve and balls. In spring controlled governor (eg: Hartnell governor) controlling force provided by spring and weights. Controlling force diagram is the curve obtained by indicating controlling force as ordinate and radius of rotation of balls as abscissa. 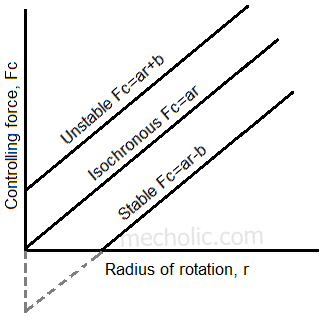 The controlling force diagram shows how the inward force varies with the radius of rotation and the effect of friction. Which also enables the examination of stability and sensitiveness of governor. Ф is the angle between the axis of radius of rotation and the line drawn from origin O to the given point on the curve. If governor is more sensitive than the change of value of Ф over the change of value of radius r should be small. 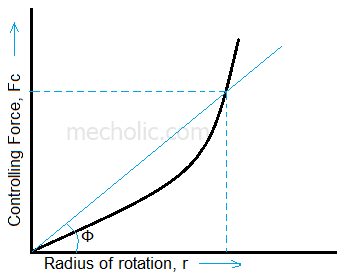 If governor satisfies the condition for stability, then angle Ф increases with an increase of radius of rotation (or the equilibrium speed with the increase of radius of rotation). For isochronous governor, controlling force curve will be a straight line passing through the origin. ie angle Ф will be constant for all values of radius of rotation. 🔗What is meant by effort and power of a Governor? The figure shows the controlling force diagram for spring controlled governor. 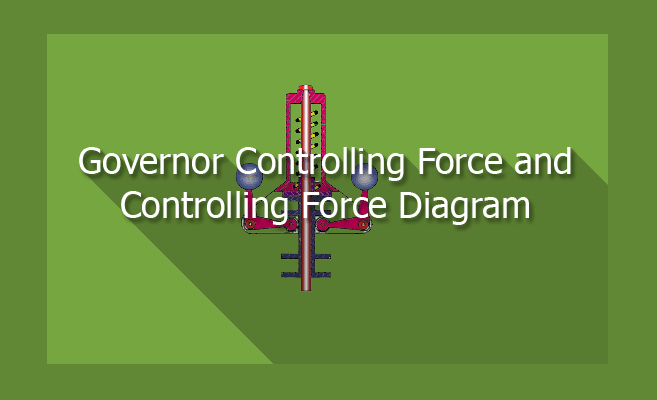 For this type of governor, controlling force diagram will be a straight line. For the isochronous governor, the curve will be a straight line passing through the origin. Fc = mω2r or Fc = ar, here a is constant. For Stable governor, the equation of governor is Fc = ar-b, here a and b are constants. In spring controlled governor, stability can be maintained by increasing spring stiffness.